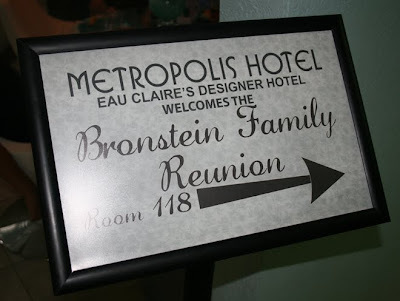 I am proud to be a Bronstein. 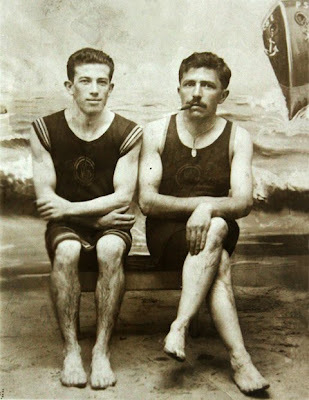 My great grandfather Michael Bronstein (not his birth name) immigrated from Russia around the turn of the last century. He married Celia Rabinowich, also a Russian Jewish immigrant living in New York City. They had six children, two boys and four girls. 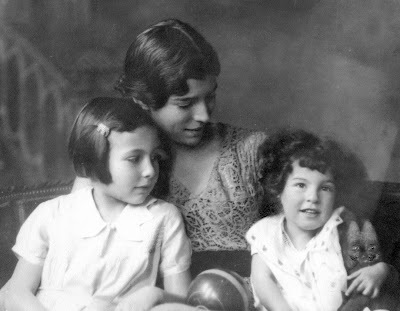 Their first born son Morris died before reaching adulthood, which was a huge tragedy, especially for Celia and my grandma Leslie who was very close to him. Other than Morris, everyone else lived into their 80s and 90s. Michael and Celia invited their kids and grandkids for Thanksgiving every year, but other than that, they didn't get together very often. You know, family politics. 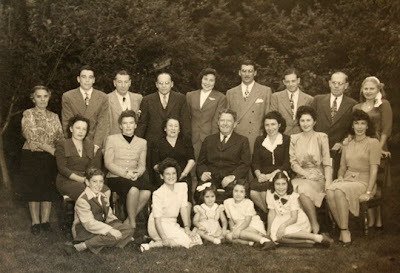 We do have one photo of a Bronstein reunion in 1945 when my mom was 15 years old. She's the tallest girl sitting on the ground. 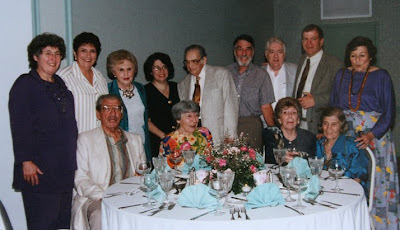 Over the years, the Bronsteins have gotten together, at wedding and bar mitzvahs, at my aunt and uncle's 40th reunion, and at my great aunt Florence's farewell party in Florida in 1995. I liked Florence's attitude. Once she knew she had terminal breast cancer she threw herself a party and invited her siblings and their children. I was one of two from my generation because I accompanied my grandma Leslie. That's Leslie seated on the right and my aunt Joan behind her (my mom died in 1983). Next to my grandma is her baby sister Florence saying farewell to everyone, with her son Eric behind her. Next to Eric are his cousins David and Bill. You'll notice an empty chair in front of them to represent their mother Ruth who had already passed away. My grandma's sister Evelyn is next with her daughter Hilde and husband Lee behind her. Their daughter Sydney was born disabled and spent most of her life at boarding facilities. Leslie's brother Burke is seated on the left with his daughters and wife behind him. 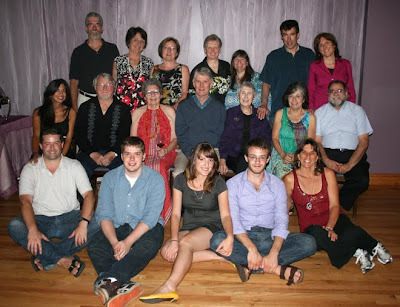 Seven of the cousins pictured above are still living, but only three were able to attend our reunion this year. 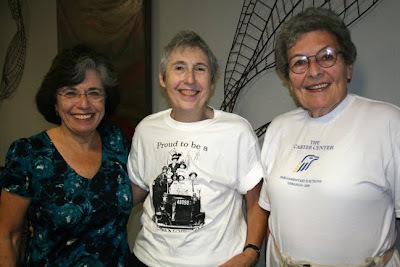 My mom's cousins Hilde and Phyllis (in the Bronstein reunion t-shirt) and my Aunt Joan on the right. Hopefully next year more of my mother's cousins will be able to attend. I've been dying to have a family reunion for years and I'm happy to say we finally succeeded. It was small this time -- only 14 Bronsteins + 6 significant others -- but we had a fabulous time and are looking forward to a bigger one next year, possibly in Florida. Above is everyone who attended the reunion. Below are the "true" Bronsteins. Back row: my cousins Steffi and Julie, then me. Next to me is David's daughter Susie who hosted the event in Eau Claire, Wisconsin. Then come Elise and Geoff whose mother Phyllis (seated 2nd from the left) read a Jewish prayer at my daughter Maya's memorial. Julie's son Jason (the one who got married in Puerto Rico in August 2006) is standing on the right. 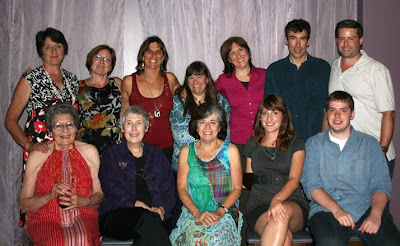 Front row: my Aunt Joan (mother of Steffi and Julie), Burke's daughter Phyllis, Evelyn's daughter Hilde, Steffi's daughter Alex, and Julie's youngest Martin. No one except for Susie lives in Wisconsin, but we held it there because she offered to host it and she's a great organizer. Not to brag, but Susie isn't the only Bronstein with a PhD. We also have several master's degrees. I'm a slacker compared to the other Bronsteins with a lowly BA. 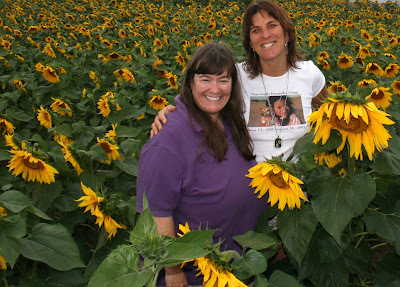 Partners in crime: Susie and I did most of the legwork for the reunion. 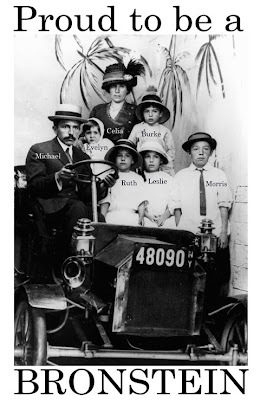 I also designed the "Proud to be a Bronstein" t-shirts, featuring a photo of Michael and Celia and all their kids except baby Florence who wasn't born yet. 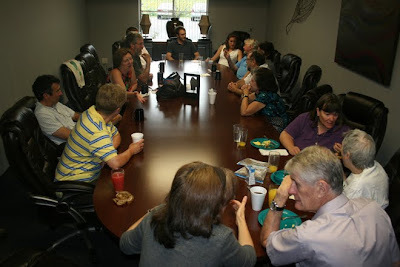 Everyone pitched in with photos, home movies, and family history and legends. 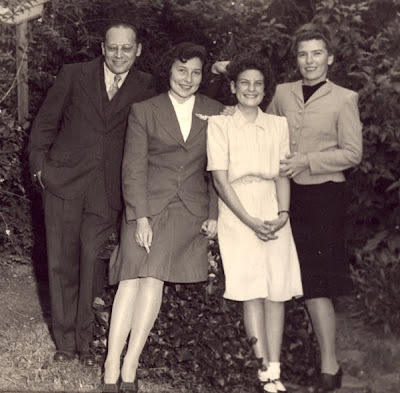 Our family talks a lot about the Bronstein Women, since my grandmother and her three sisters were all very strong and dynamic. Their daughters and granddaughters have followed in their footsteps. I will be the first to admit, a Bronstein Woman is not always the easiest person to live with. But at least we keep life interesting. 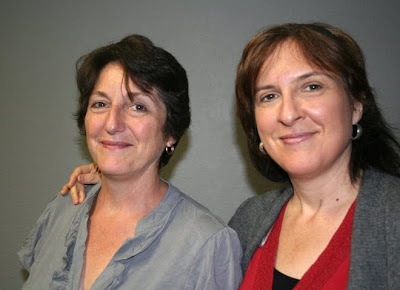 If you want to know what a Bronstein Woman looks like, here are my 1st cousin Steffi and our 2nd cousin Elise (Phyllis' daughter). The resemblance is remarkable. You'd think they were sisters, but in fact Steffi's grandma and Elise's grandfather were siblings. 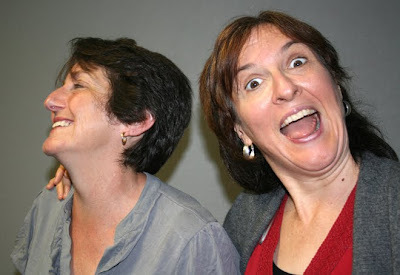 See what I mean about Bronstein Women? We're a special breed and lots of fun. We also found out that another Bronstein is on the way. 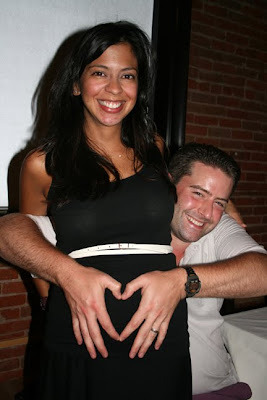 Jason and Jessica announced that they're expecting their first child early next year...later confirmed to be a boy. Michael, charismatic and handsome, became a successful butter and egg man, eventually opening a grocery store. His business grew and grew until he owned a chain of supermarkets called Fairmart. 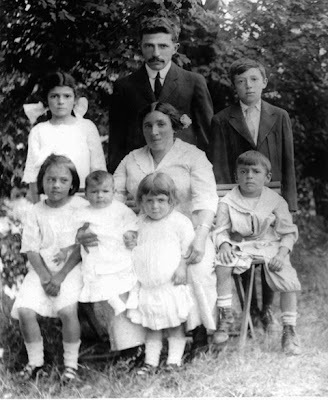 Michael and Celia had six children: Morris, my grandma Leslie (standing next to her father), Ruth, Burke, Evelyn and baby Florence. Morris was sickly and died of rheumatic fever as a teenager. When Burke took over the family business, Michael and Celia retired to Florida. My grandma Leslie wanted to marry her high school sweetheart -- a starving lawyer, as they said in those days -- but her father refused because he wanted someone more successful. 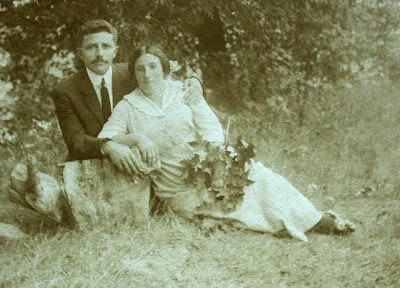 She married my grandpa Jacob Alexander Ronder and had three children, Joan, Zachary and my mother Elisabeth. Zachary only lived a week or so. Joan later named her firstborn child after him. That's my mom with the thick, curly hair that I didn't inherit. During the 1960s when long, straight hair parted in the middle was in style, I was happy not to have the curls. I have my dad's straight hair, but my face is definitely Beth's, as she was called. 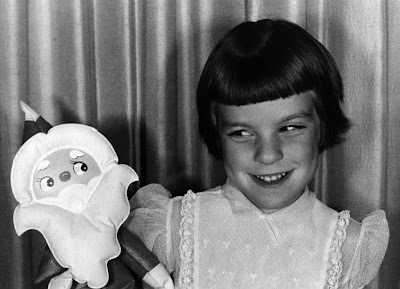 Is that me, or is that me with the devilish smile? 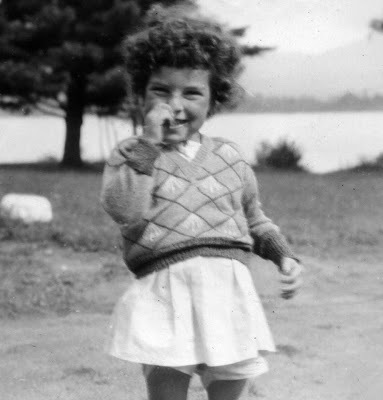 Actually, it's my mom as a little girl. The picture below is me at about the same age. Same smile, same eyes that "wrap around the block," as my grandma Leslie liked to say. I've been asked twice if I were from Afghanistan, which isn't that far from the Ukraine of my mother's ancestors. One was an Afghan woman who taught ESL at Adult School with me. She claimed I look like the famous refugee on the cover of Life Magazine with the piercing green eyes (I wish!) and the other was a Pakistani immigrant at a gas station. He asked me where I was from, but didn't buy my answer: Santa Cruz. Before that? he asked: San Diego. Before that? New Jersey. I asked him why he wanted to know where I was from. He said, "You look like Afghan woman to me." I think it's the eyes, and maybe my olive complexion. 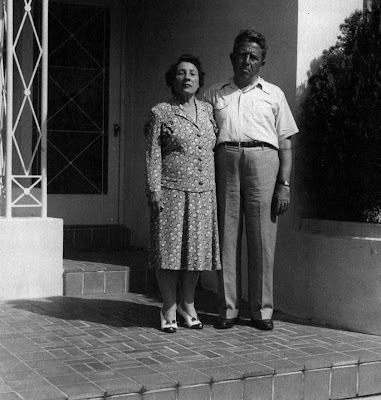 Joan married Arthur Domike in 1950 (below). They're celebrating their 60th anniversary next year, but haven't decided where. Maybe New Zealand where their son Zack and his Chilean wife live. 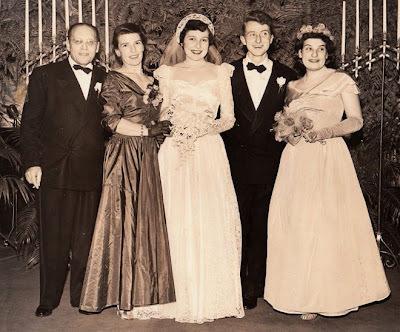 (left to right) Jack Ronder, his wife Leslie Bronstein Ronder, their daughter Joan and her husband Arthur Domike, and on the right, my mother Elisabeth "Beth." She married my dad John George three years later at the age of 23. 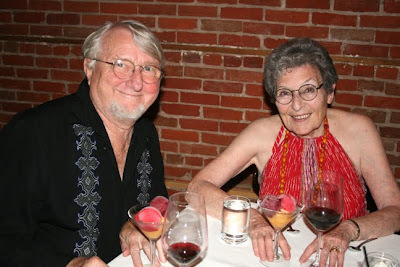 Joan and Art are 83 years old and still together. They are politically active, play tennis, travel, and attended our Bronstein Reunion. Their children Zack, Steffi and Julie grew up in South America when Art was working for the U.N. I got to know them when I was a teenager. They're my only cousins and I feel as close to them, as if I had siblings. Here's a picture of my "hippie" cousins (alias John Lennon, Meryl Streep and Joan Baez), about the time they moved back to the U.S. Standing L-R: Arthur, Joan and Zack Domike. 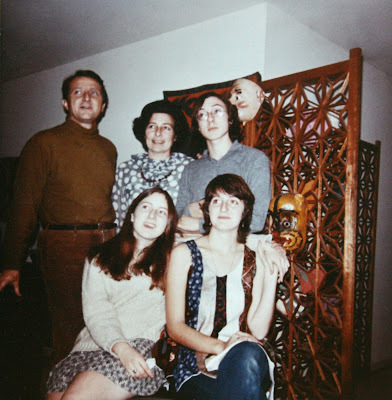 Seated L-R: Julie and Steffi Domike, circa 1971.